Stabilizing your rig is not necessary but doing so may make your RV more pleasant to be in. The smaller the Fifth Wheel or Travel Trailer the more it can benefit from stabilizing systems. You might want to have a few six to eight inch long 2×6 blocks and some stabilizing jacks. How many of each will depend on the size of your RV and how stabile you want it to be. The blocks are placed under the jacks to give them more support if you are parked on soft ground or if the jacks are too short. Plastic ‘blocks’ are also available and have some advantages over wood blocks. The biggest advantage is less weight to carry. They are also stackable and have a larger surface area. Some travel trailers and fifth wheels have stabilizing jacks attached, usually toward the rear. If yours doesn’t you should consider getting some. They just make stabilizing the rig easier. If you do add them be sure to note the lifting capacity. Generally the scissors type have the greatest capacity. If your jacks can lift your RV then they may be able to double as leveling jacks too. 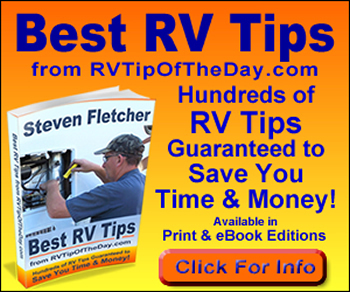 Make sure your RVs frame can handle the jacking without damage. Ask the manufacturer if you’re not sure. Our fifth wheel had the crank down type stabilizers already installed, otherwise I would have the scissors type because they will lift more weight. When leveling the trailer front to back I like to set the rear stabilizer jacks snug then lower the front landing gear raising the front of the trailer up to level. This lifts the trailer up slightly off the axles. I found by doing this I can get the trailer more stable without having to really crank hard on the stabilizer crank handle. Because my stabilizers can’t bare much weight I have to be especially careful about how much I lower the front landing gear. If we will be parked for more than a few days I also set a couple of the jack stands under the frame behind the back axle for more stability. I also use and recommend a king pin stabilizer for fifth wheels RVs. It really does work.